Making your dorm bed a big part of your college decor is easy with our one of a kind Twin XL bed skirts. A dorm size bed skirt is the perfect addition to your college bedding if you want to enhance the overall appearance of your dorm room. And with our Threads Bed Skirt Panel with Ties - Gray/Teal you have the option to add the perfect amount of college bed skirt to your extra long Twin sized bed. 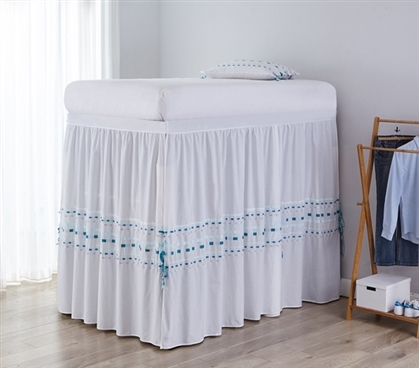 These dorm bed skirt panels are the perfect size to cover the space between your dorm room floor and your raised Twin extra long bed. Just choose the number of Twin XL bed skirt panels you need and they are easily attached using ties. Of course, the obvious design contribution these one of a kind college bed skirt panels make can be seen just by looking at them. The stylish look of these beautiful Twin XL bed skirt panels is upgraded by the included gray and teal colored ribbons that are threaded through this essential dorm bedding item. The gray thread will help match your extra long Twin bedding with the rest of your college decor while the teal thread will give your dorm room a pop of color. These college bed skirt panels will also help you hide your underbed storage. Dorm underbed storage is essential in a small dorm room, especially if you have a raised Twin extra long bed. But if you are organizing your dorm room by using the essential dorm underbed space to hold your college essentials, that can start to look messy too. No problem! With these extended fashionable dorm room bed skirt panels you can easily take care of that little issue, leaving your dorm room looking tidy and organized.